To succeed in the highly competitive CLAT 2019, you need to find the best study materials for your exam preparation. You can only crack this competitive exam at the first time if you find the right strategy and approach. A coaching center will be very helpful for your preparation. Here you can get in touch with Opus Way which is a renowned and finest CLAT Coaching center across India for its fantastic result since 2010. The OPUS study materials are really helpful which cover the CLAT structure and model with the appropriate depth for the entrance examination. The learning environment of Opus always Deserves the favor of candidates who do many exercises and want to learn clearly to be able to absorb much more. The appropriate effort in practical exercises and explanations in the study material provides aspirants with a clear idea of the type of strategy they are pursuing and how hey should remain consistent without distracting the minds of many other institutions. In Opus, the faculties are superb and especially the doubt clearing classes. For any difficulties teachers always help students to find the root cause analysis of the problem and then evaluate it for the solution, students must be absolutely sure of their CLAT preparation. 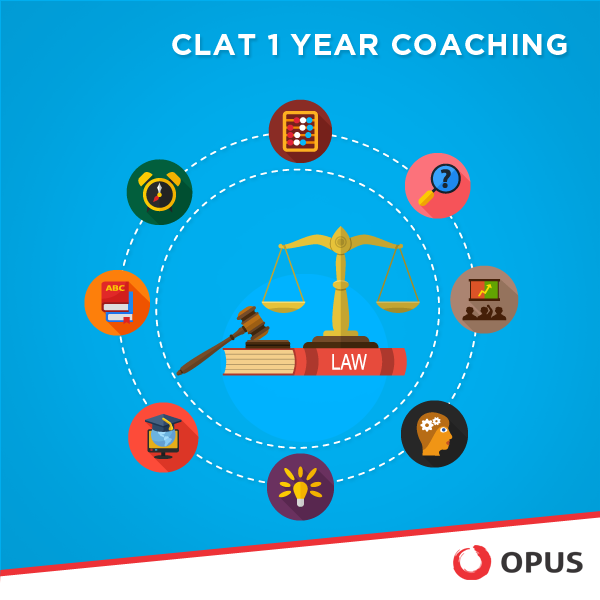 The OPUS study material is very particular, updated and helpful for all CLAT aspirants which is totally different from other Law entrance coaching institution which is easily available in the market or online. Hence for best result in the final CLAT exam Join OPUS to improve your prospects. OPUS offers the best learning material for all CLAT aspirants. Communication takes place based on the thematic area in English, general knowledge, legal aptitude, mathematics and logical reasoning are the main five areas of the CLAT exam. The learning material was developed by our team of experts and includes the latest CLAT exam program and questions from the CLAT questionnaire in recent years. While trainees train and understand the problems of the last few years, they also know the types of questions and pattern easily. For CLAT 2019–20, English section includes reading comprehension, correction of wrong phrases, active and passive voices, grammar, verbs and more. Resolved and unresolved issues are also included. In CLAT exam the main five sections are Logical reasoning which consists of questions of logical thinking, logical sequences, and analogies. However, visual thinking is not tested. The purpose of logical reasoning is to test the candidate’s ability to identify patterns, logical connections, and correct illogical arguments. Another part is general knowledge and current affairs will cover all types of GK and current topics. Next is the mathematics section and the last section is Legal aptitude test which will examine the candidate’s interest in law studies, is research skills and his ability to solve problems. All these five sections of CLAT exam cover very attentively and carefully in opus Coaching center in such a way that an aspirant can easily crack the tough CLAT exam in first chance. So do not waste your time call Opus today and join their demo CLAT coaching classes.